The thing I dislike most about winter bicycling is the fact that it takes five minutes to get dressed and undressed. Summer is so much easier. And there’s no guesswork either. The next most dislikable thing about winter bicycling is cold feet, especially toes. Despite riding in New England for six years and in DC for the another 34, I have yet to find a satisfactory solution to the cold feet problem. I use pedals and toe clips. Most of the time I ride with mountain bike shoes. Shimano came out with some that are extra wide which is a must for my super wide feet. Down to 50 degrees, I just wear wool socks. Even when it rains. Below that is when things get difficult. I have three solutions, none of which is ideal. Solution 1: Put chemical hand warmers in my shoes. Toe warmers fit better but hand warmers put out more heat. I try to place them on the top of my forefoot. Solution 2: Performance brand over boots. These clodhoppers go on over your shoes. They have a liner that is fairly warm and a smooth, flat rubber sole that keeps my feet dry when the grass is wet on my walk out to my shed. The over boots drawbacks include: they are a pain to get on, they don’t grip the pedals like my shoes do, and they change my pedaling mechanics. Solution 3: Hiking boots. 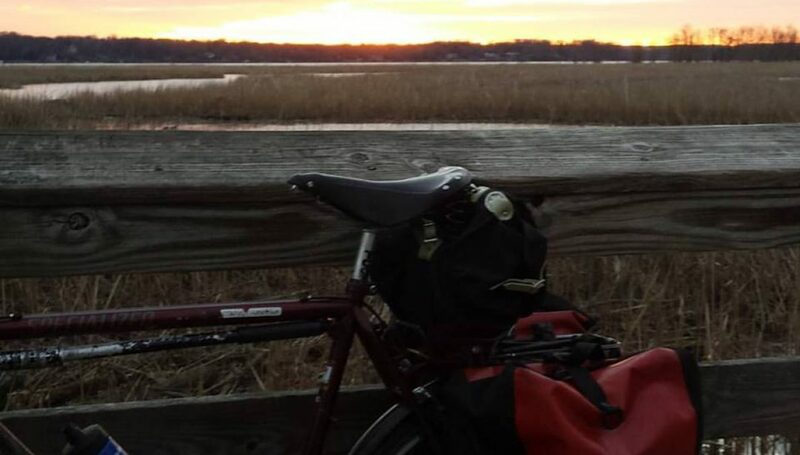 I recently saw some Instagram pictures of a #bikedc acquaintance who went bikepacking on the Blue Ridge. She and her friends wore hiking boots. I have some Gortex hiking books that are pretty comfy but they have thick soles that change my effective leg length. If I ride a long way in these boots. my knees bark. I also have battery powered socks. They eat batteries like popcorn. Not a good solution. I asked the Twitterverse for some better ideas. Here are some of the responses. Smear Vaseline on your feet. Put plastic grocery bags between your socks and shoes. Giro Alpinduro bicycle shoes with wool socks. Wear wool socks and sandals. So that leaves me with wool socks and sandals. I tried this out today with some really thick Smartwool socks and my Teva sandals. The temperature was in the low 40s with gale force winds, making for wind chills in the low thirties. I was surprised at how well this worked, at least for the first 17 miles. Then my toes got pretty cold, especially when riding into one of the gusts. I managed to ride 31 miles though and my feet comfort level was not horrible. I think this solution might work better with closed toe sandals. Regardless, had it been any colder or had my feet become wet, I think my toes would have been miserable. Skiers are much more dialed in to winter foot comfort issues. Friend of the blog Rudy is an accomplished skier (with a once broken femur to prove it). His solution is to accept your fate. Use platform pedals and winter boots. Winter is for skiing, dude. So, long story short, there is no good solution. Experiment. Toughen up. Or ride Big Nellie in the basement. Or find another sport for a few months. Posted on November 28, 2018 November 28, 2018 by rootchopperPosted in #bikedc, winterTagged feet, winter, winter bike clothing. Ha! When I was walking in Scotland in my Teva’s I put hand warmers in my wool socks. Cold toes are my least favorite thing, having Raynauds makes it 10x worse. I was worried that it might mess up the skin on my feet. I use platform pedals with winter boots. I stay warm for up to an hour. If it was any longer I’d be in trouble. The only way I could stay warm would be to walk…and I used to do that on longer commutes. jump off the bike and jog up a hill. Worked wonders for my circulation, either that or cry. I did notice that the few times that I stopped and moved my left foot around on the ground that that foot warmed up a bit. So I made it a point to wiggle my toes and move my feet around on the pedals from time to time. Fashionable? When I ride in winter, I dress like a homeless person. I wear a pair of my regular riding socks under a pair of wool socks. I also make sure my head is covered with a mask and woolen cap. “When your feet get cold, put on a hat.” is a wives tale that’s apropos. I just got a pair of Bontrager “Old Man Winter” boots. Last year’s style is marked down ⅓; still expensive, but I’m hoping for a cold morning to see how they work. So far, with temperature in the teens and wind chill down to 5, they’ve been toasty warm. They feel like they’ll be fine below zero. They have SPD cleats, Vibram soles, weigh less than the bike shoe/neoprene bootie combo I used to use, and run small.